Seattle was anti-freeway before being anti-freeway was cool. Today we complain about the traffic, but the mainstream solutions of the 1960s and ‘70s would have made things much worse. We’re bringing down the Alaskan Way Viaduct--demolition is slated to begin in early 2019. Safety was a huge factor in replacing the earthquake-weakened structure with a tunnel, but so too was the desire to correct an urban-planning wrong of putting a concrete barrier between downtown and the waterfront. But the viaduct and raised freeway model could have been replicated all over town. In the early 1960s, Seattle planned to build a 15-mile expressway from the Duwamish to Bothell, the R.H. Thomson. Then there was the raised Bay Freeway that would have run across and walled-off South Lake Union. And a massive trench freeway and interchange-–the Empire Expressway--was also planned to go along with a massive widening of I-90 through the Central District. It was road-builder’s madness. These projects would have resulted in displacement, environmental damage, and thousands of home demolitions. The city had already experienced being split in two by I-5—advocates of lidding that “ditch” lost their fight (though the lid idea has been revived, which we cover in the March issue of Seattle magazine), and it is still a tear in the urban fabric. 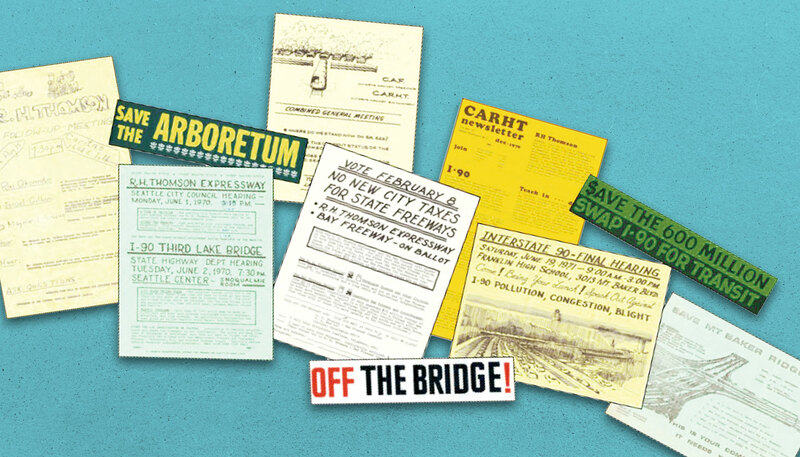 In any case, activists rallied and launched multiple efforts to rollback the freeway plans. Thus began what some call Seattle’s “Freeway Revolt,” the most visible signs of which are the “ramps to nowhere” in Montlake (currently being demolished for the SR 520 re-do). The activists ranged from University of Washington professors and students to Saul Alinsky-trained community organizers to Montlake moms to Black Panthers. Broad coalitions were formed to fight City Hall. Two groups, Citizens Against Freeways and Citizens Against R.H. Thomson were formed 50 years ago this year. It is, and should be, an inspiring chapter in Seattle history and a group of local activists are working to make sure the deeds of defeating what some described as the “concrete dragons” are remembered. To that end, the Seattle Public Library with a grant from King County’s cultural and heritage agency, 4Culture, and a group called ARCH (Activists Remembered, Celebrated and Honored) have created a new online resource that brings together the documents, newspaper articles, photos, timelines and other relevant research materials so the public can access our history of anti-freeway activism. The stories of the fights are complex and often inspiring. R.H. Thomson, for example, was voter approved but years of education and publicity raised concerns about the impacts that eventually caused the voters to change their minds. Seattle has always been willing to reconsider decisions—it is frustrating, but often gets to a better answer. The city has a history of grassroots organizing, and this is a fine case study. Some might complain that if the planned freeways and massive interchanges of the ‘60s were built traffic would be better today. If you think so, just look at Los Angeles. While we were right to reject R.H. Thomson & company, we weren’t always right, as when the region failed to pass mass transit in the same time frame. On that score, we’re trying to play catch-up with regional light rail, but at least we’re on the right track. Much of the impact is found in what didn’t happen—neighborhoods preserved, demolitions that didn’t occur, freeway walls that weren’t built, cleaner air. It is also reflected in the deep environmental concerns for creating a sustainable city that would be much harder to reach had all these freeways been built. These Seattle activists showed that citizens can build exit ramps for bad ideas. That’s worth remembering.